Memo to FIFA (and the England team, whose execrable performance in South Africa still has me shaking with anger). See what technology can do to your balls? 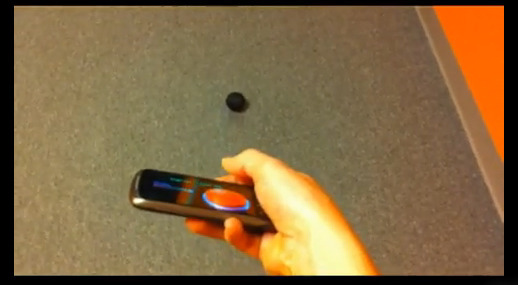 Gearbox is a start-up that makes smart toys “how HTC/Android/Apple make smart phones,” and the first element of their app-based stable is a smart ball that can be controlled by an Android handset. It’s a robotic sphere consisting of a 3-D printed spherical shell and a custom circuit board inside. But it’s the apps that sound the most fun. Their first is called Sumo, which allows players to pit two balls against each other, using their phones in order to try and beat the other. Collisions make the balls go slower and players can even reverse each others’ controls on the ball. And all the while, the phones can display game and ball stats. Based in Boulder–cue rolling stone jokes–the team consists of Ian Bernstein and Adam Wilson, a pair of robot-obsessed entrepreneurs and they’re throwing their APIs open for other app developers to develop games–Bernstein has even suggested Office Golf, Curling, and a few more that–well, you should just read their ideas here. And then check out the video below.